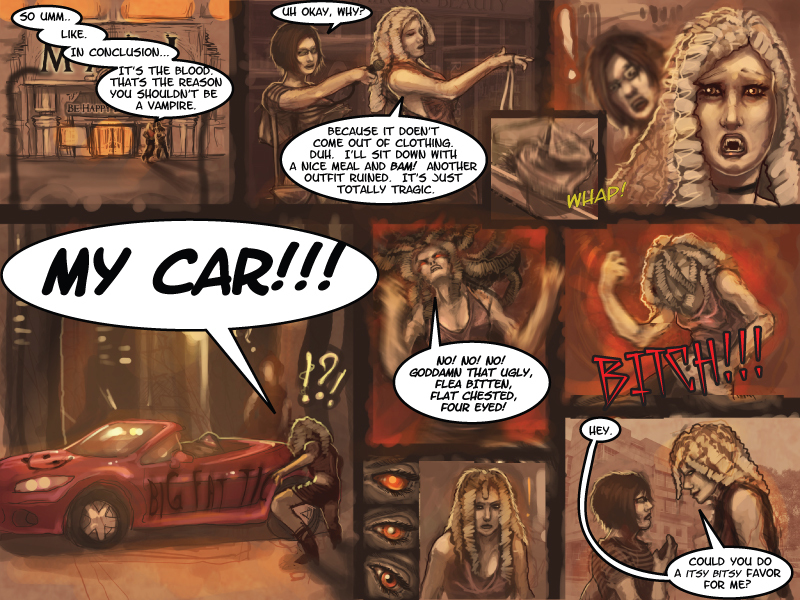 This page was written by Dan Potter and drawn by Sam Ireland (http://walkingthelethe.com). Dan is a horror writers and Sam’s styles is suited to that sort of story. Thus we come to one of the weaknesses of the Exquisite Corpse format. We go from a quirky light hearted vampire parody to something a bit more sinister in tone and feel. The art change can be quite jarring to the reader as art defines the tone and expectation for the work. The story I think is a good mesh but the art is a bit of a grand shift. Since the time this comic was made I have soured on the Exquisite Corpse format for anything other than a party game. In general the stories start out very strong with lots of unique twists and turns. The problem is always the ending. Instead of things getting wrapped up in a satisfactory manner the stories tend to start spinning out of control each page getting weirder and weirder. In the end it becomes a unmanagable mess that no one can write and there is no reasonable conclusion to the mess that went on. But the beginnings are great. The 8 pages of Celine were really fascinating to read. As was the first 20 pages of Troop 37 the comic that inspired this one. It’s page 21 that always kills you in these stories.